Mentally ill people in the developing world are being badly neglected, according to a study published in the Lancet medical journal. 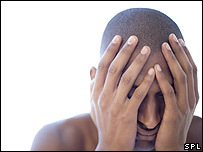 The authors say mental illness makes up about 14% of global disease, more than cancer or heart disease. Up to 800,000 people commit suicide each year, mostly in poorer countries. Despite this, the authors say, 90% of sufferers in developing countries receive no care - and in some cases are chained to trees or kept in cages. Health officials call for new strategies and more money for treatment of the mentally ill in the developing world in a special series published by the Lancet. They warn that as more people suffer from mental problems as a result of war, poverty and disease, unless widespread treatment becomes available, poor countries will be further handicapped in the future. The study says that in poor rural communities, families living in poverty cope the best they can with mentally ill relatives, but are often unable to afford medication or specialised care. In some countries, it adds, mental illness was seen as a stigma. The report also stresses the impact of mental health on other health conditions. It says poor mental health makes people more prone to other health problems - and then they are also less likely to get the medical help, social support and treatment they need. Their dependents may suffer too, it adds, citing evidence from India and Pakistan that mothers who are depressed are more likely to have a malnourished child. Nirmala Srinivasan, head of Action For Mental Illness, a lobby group based in Bangalore, India, told the Associated Press news agency that only 7% to 8% of an estimated 40 million to 50 million people in India who were victims of some form of mental illness - schizophrenia, depression, obsessive compulsive disorder, anxiety - got proper treatment. 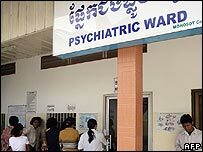 The study acknowledges that many poorer countries are often presented with a stark choice when it comes to the treatment of mental patients, given the scarcity of resources. But many of the experts say basic mental health services can be provided cheaply and simply, especially if they are made part of general healthcare.